Brett Clark is a former BC wrestler and is now the new head coach of the wrestling team at BC. If the gogades.com website has yet to update Bakersfield College’s newest head wrestling coach’s icon, good, because the man is as rugged, gritty and hard-nosed as the knight shown in the picture. “The man” behind the mask would be none other than Brett Clark, a Bakersfield native whose resume for overseeing the wrestling program, which after the last 27 years spent under former Renegade wrestling head coach Bill Kalivas, is the most compatible suitor. “I’ve wrestled for [Kalivas], so I know what he was brought to this program. We have our own way moving forward, but it won’t be much different.” Clark mentions. Introduced to wrestling at the age of nine by his father, who wrestled at BC in his heyday, Clark was part of the Jr. Driller Wrestling Club. Sure enough, the “Once a Driller, Always a Driller,” saying played a role on Clark’s future. He eventually attended Bakersfield High School and was a two-sport phenom in both football and wrestling. With wrestling, Clark excelled ranking fourth in the nation, and on the football field was part of the historic Driller teams of the mid-90s protecting local football legend Steve Wofford. After graduating in 1995, Clark came up the hill to Bakersfield College to continue right where we left off in high school. He earned himself a football scholarship and a chance to rejoin former teammate, Wofford, at Southern University, a historically black college located in Baton Rouge, La. The football journey didn’t stop in the Bayou, either. Clark went on to play his last bit of the game professionally for the Arena Football League’s, Los Angeles Avengers for two full seasons and Wilkes-Barre/Scranton Pioneers (Pa.) for a couple more. Clark later ended up coaching the Pioneers after a few local stints. Prior to Clark’s playing and coaching career with the Pioneers, he transitioned back to his first love, wrestling. 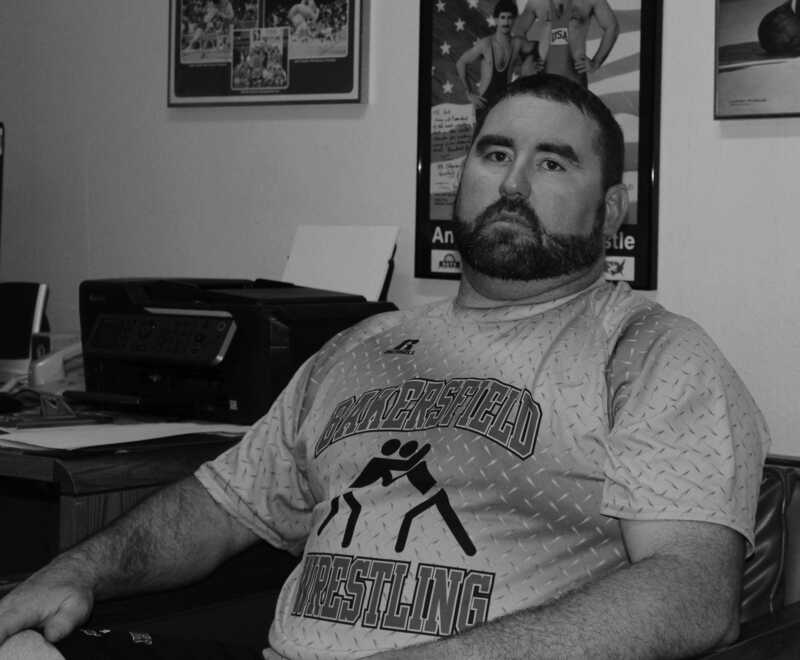 As a heavyweight, Clark wrestled for the Renegades wrestling team from 2001-2004, reaching State in back-to-back seasons, completing a near perfect season record of 32-1, and gaining All-American honors. From there on out, it has just been about giving back to the community for Brett Clark through the sports that shaped him. With stops at Bakersfield High, North High, Cesar Chavez High (Delano), and most recently Mira Monte High, Clark has done a tremendous job helping out with football and wrestling programs throughout Kern County. “I just want to make sure guys are going to be molded into young men. There’s far more in it than just wrestling.” says Clark. With his first year under way however, Clark has some personal and team goals as well. He will be making his coaching debut at 7 p.m. here at the Gil Bishop Gymnasium on Sept. 19 after the first matchup against Victor Valley scheduled for Sept. 13 has been canceled due to shortages of players from the opposition. “Other than staying on top of paperwork, I really want to get these guys prepared – especially later in the year heading towards Regional’s and State, getting these guys qualified.” Clark also states. Filling in the shoes for someone who has coached this wrestling program for nearly three decades is a huge obstacle, but Clark brings a wide diversity and a knack for the game to the table. “My dad is from Bakersfield, I’m from Bakersfield. My dad played football up here (Bakersfield College), I played football and wrestled here. So through and through, we’re a Bakersfield College family,” Clark expresses.